With the opening ceremonies for the 2016 Rio de Janeiro Olympics getting underway tomorrow, swimming enthusiasts are anticipating whether -- and to what degree -- Michael Phelps will be able to extend his career-total medal haul. He currently owns 22 Olympic medals, 18 gold, 2 silver, and 2 bronze. In terms of Olympic streaks, Phelps has ongoing runs of three straight golds in the 100-meter butterfly and the 200-meter individual medley. 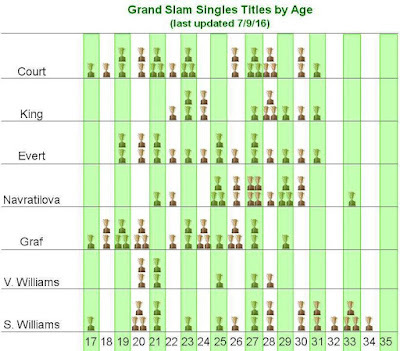 He will attempt to extend each of these streaks to four in a row. Before Phelps won the two aforementioned events in 2012, no male swimmer had won the same event at more than two straight Olympiad. He will swim a third individual event in Rio, namely the 200 butterfly, in which he narrowly missed a third straight gold in 2012. The following chart (which you can click to enlarge) shows Phelps's medal performances not just at the past three Olympiad, but also at the World Championships and Pan-Pacific Championships. The chart includes only the three individual events he will swim in Rio. Phelps did not compete in 2013 due to his brief retirement, plus USA Swimming kept him off the team for the 2015 Worlds for his drunk-driving offenses. Sports Illustrated's pre-Olympic issue picks Phelps to win one gold -- in the 100-meter butterfly, just ahead of Hungary's Laszlo Cseh. Within 2016, Cseh (50.86) has actually swum this race faster than Phelps (51.00), but we don't know that all circumstances (e.g., amount of rest; pool conditions) were comparable. (You can look up the world rankings in any event, based on fastest times, at the international federation's website.) SI tabs Cseh over Phelps in the 200 fly, and Japan's Kosuke Hagino over Phelps in the 200 IM. Perhaps it’s the Cubs’ historical futility – anyone can have an off-century, paraphrasing former manager Tom Trebelhorn. Or perhaps it’s the reputations of current team executive Theo Epstein and manager Joe Maddon. Whatever the reason, the team’s fast start this season inspired no shortage of superlatives from the media. On May 15, with the Cubs sitting at 27-9, CBS Sports.com splashed around words such as “historic,” “remarkable,” and “incredible” in describing the team’s start. On June 7, with the Cubs having advanced their record to 40-16 the night before, FiveThirtyEight made the stunning comparison of Maddon’s bunch to the 1927 Yankees. Now, as the season resumes Friday after the All-Star Break, the Northsiders are 53-35. The team’s record has been 26-26 since the CBS Sports article and 13-19 since FiveThirtyEight’s piece. The Cubs’ slide began on June 20, the opening day of a three-game Wrigley Field series with St. Louis, which the Cardinals swept. Chicago has now lost five of its last six series (plus a one-game make-up game with Atlanta). Using the Cubs’ game-by-game log, I plotted the results of all of their series so far this season, in chronological order. 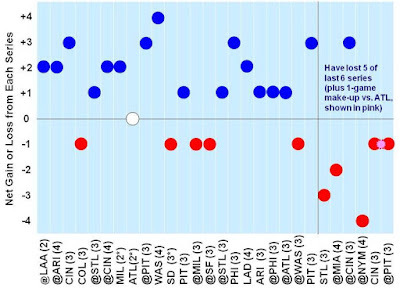 Opponents are shown on the horizontal axis and the outcome of each series is shown on the vertical axis (sweeping a three-game series would be +3, getting swept four would be -4, etc. 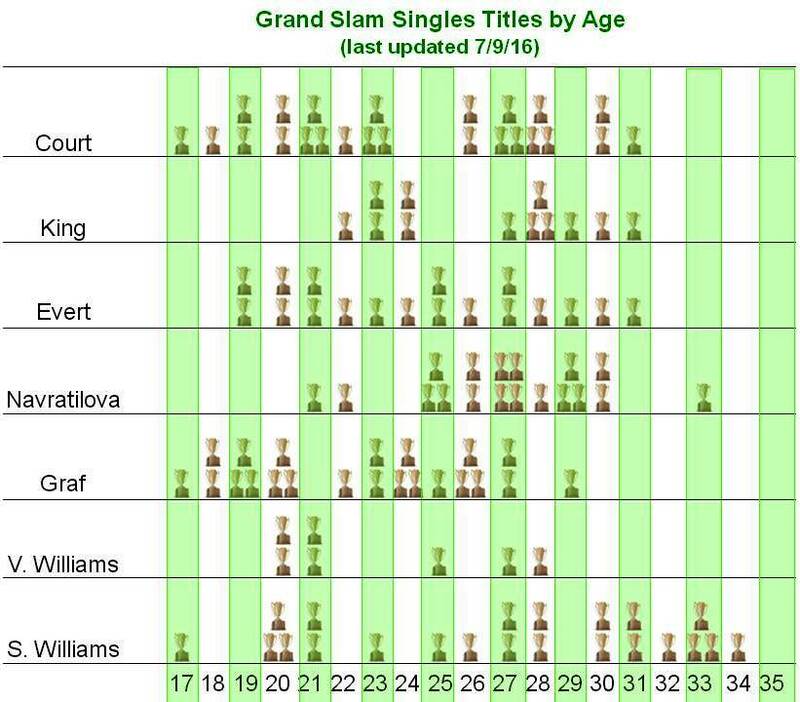 ; see legend below the graph). You may click on the graphics to enlarge them. Presumably, the Cubs have declined in one or more of the following areas: hitting, pitching, and defense. Hitting does not seem to be the major problem. The team’s two leaders in OPS (On-base Plus Slugging percentages), Anthony Rizzo and Kris Bryant, have maintained a torrid pace. In fact, Rizzo’s two best monthly OPS figures have come in June (1.211) and July (1.178). The same is true for Bryant (June, 1.058; July, 1.222). Addison Russell and Jason Heyward have been steady, if unspectacular, with monthly OPS values in the .700-.800 range of late. That’s not to say that nobody has slumped. Dexter Fowler’s OPS in April, May, and June fell respectively from 1.087 to .879 to .605, and Ben Zobrist has fallen to an OPS of .707 in June and .640 in July, after he had attained a 1.136 in May. Still, there is no universal collapse in hitting among the Cubs. To evaluate starting pitchers’ individual outings, I use the “game score” statistic developed by Bill James. The scoring system starts a pitcher out with 50 points, then adds points for good pitcher outcomes (e.g., 1 point for each out, plus an additional point for a strikeout) and subtracts points for bad outcomes (-2 for each hit allowed, -4 for each earned-run yielded). Game scores for each and every start by a given pitcher are included among ESPN.com’s pitching statistics. I have plotted game scores for each of the Cubs’ five regular starters, shown in chronological order. 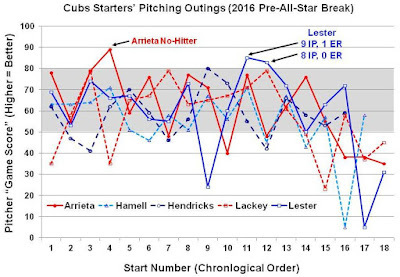 Although the data are noisy, the general trend is that Cubs starters – four of whom are age 30 and older – began declining around their 15th starts. 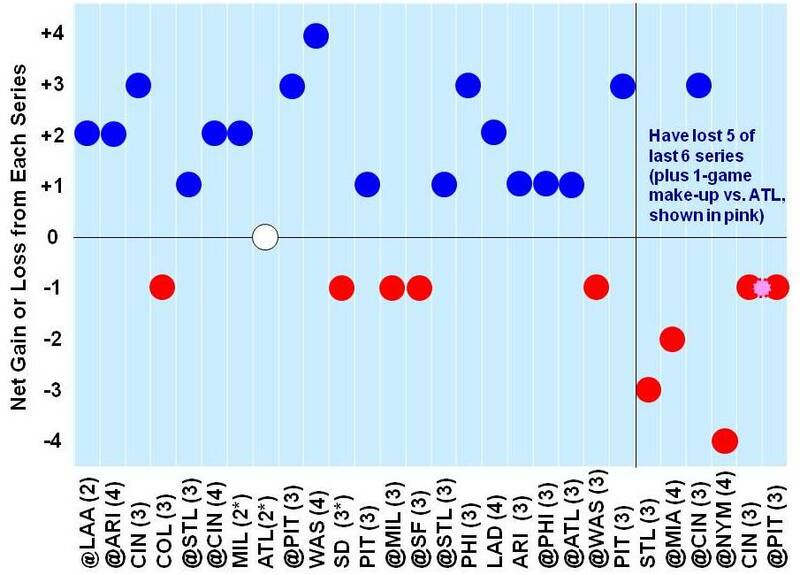 Before that, most outings were in the 50-80 range (highlighted in gray), meaning that pitchers made a net gain in points above the 50 with which they automatically started. John Lackey recorded a 23 in his 15th start (a 9-6 Cubs loss at Miami), Jason Hammel struggled badly with a 5 in his 16th start (a 10-2 loss at the Mets), and Jon Lester also registered a 5; this came in his 17th start, another blow-out loss (14-3) at Citi Field. Jake Arrieta, though not hitting the low points of some of his teammates, has thrown clearly subpar games in his last three starts (game scores of 38, 38, and 35). 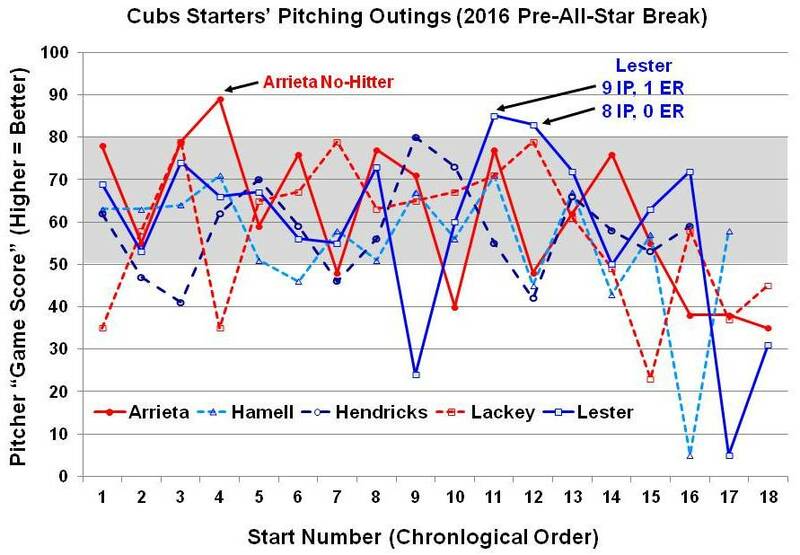 Kyle Hendricks has been the even-keel starter, never deviating from a range of 41-80. According to another FiveThirtyEight article, as of June 19 (right before the Cubs’ spate of losing series), Chicago pitchers appeared to be benefiting from two developments: their “contact-management skills” or “tendency to allow batted balls that do less damage;” and excellent defensive play from the fielders. Getting into the physics of batted balls, “Cubs pitchers [had] depressed exit velocity by 0.4 miles per hour and launch angle by almost 2 degrees, relative to average.” In terms of fielding, free-agent acquisition Heyward has saved 35 runs with his defense in 2015 and 2016 combined, according to one estimate, which is one of the best performances for an outfielder during this time. One would guess Cub pitchers lately were allowing balls to leave opposing bats with greater exit velocity and launch angle, although I do not have updated statistics on those parameters. The Cubs need some rest, according to Maddon. That’s as good a recommendation as any, especially for the starting pitchers. 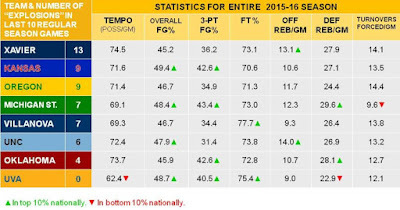 With the annual NCAA men's basketball tournament getting underway, I wanted to apply a measure I originally developed for the Golden State Warriors, namely offensive "explosiveness," to the leading teams in March Madness. Reuters news-agency blogger Chris Taylor contacted me a week ago, as part of his investigation of statistical tools that might inform March Madness predictions. I told him about explosiveness, which he included among his "Seven tips for crunching March Madness math." As Taylor characterized my explanation of why one might want to study explosiveness, "Winning teams need to be able to come back from behind, or pull away [in] close games." 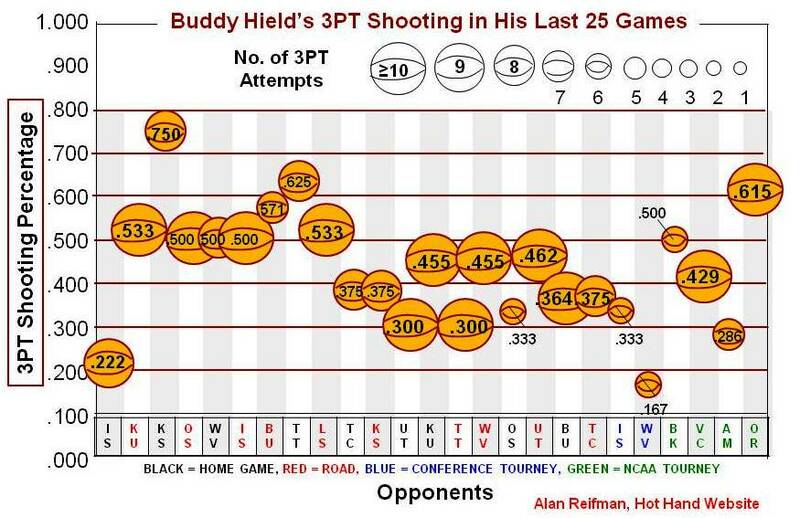 It remains to be seen whether explosiveness has any predictive power in this year's NCAA tourney. However, as I told Taylor somewhat flippantly, "It seems to work for Golden State!" In the remainder of this posting, I discuss explosiveness in greater detail. The explosiveness statistic measures high-scoring bursts in short stretches of time. 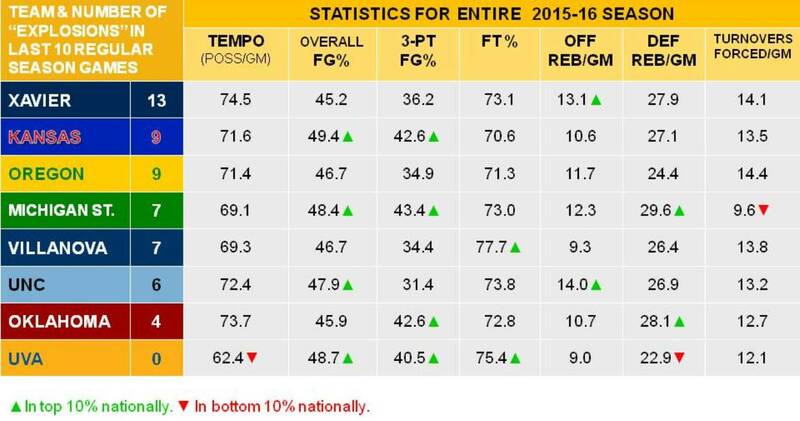 Instead of looking at 12-minute quarters in the NBA, I looked at 6-minute "eighths" of games. An explosive burst in NBA play is defined as scoring 18 or more points in 6 minutes (3 points per minute), which if maintained over an entire 48-minute game would yield a whopping 144 points. In the Warriors' first 25 games of the present season, in nearly one-fourth of all their 6-minute blocks did they register an explosive burst. For the 40-minute length of college-basketball games, I looked at 5-minute blocks (one-eighth of regulation game-length) to see how often teams scored 15 or more points (i.e., 3 points per minute). Due to time constraints, I analyzed only the top eight projected teams in the field (i.e., all the No. 1 and 2 seeds in the bracket) and looked only at each of these teams' final 10 regular-season games. I did not include overtime periods, so each team had a total of 80 5-minute blocks. As shown in the following table (on which you can click to enlarge), the eight teams varied greatly in their explosiveness. In one game alone, vs. Creighton on March 5, the Musketeers pulled off three bursts (play-by-play sheet). Xavier went from having 44 points at halftime to 60 points with 15:00 min remaining; from 66 points with 10:00 left to 82 with 5:00 to go; and 82 with 5:00 left to 98 points at the end. At Seton Hall on February 28, a game in which the Musketeers trailed 45-26 at the half and ultimately lost 90-81, Xavier rallied feverishly in the second half. XU went from 43 points with 10:00 left to 58 with 5:00 left; and from 58 with 5:00 left to 81 at the final buzzer, a 23-point super-explosion (play-by-play). Kansas (No. 1 seed in South region) and Oregon (No. 1 in the West) followed with nine explosive bursts each. Oklahoma (No. 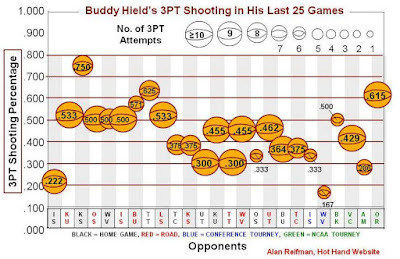 2 in West) surprised me with only four bursts, given the excellent three-point shooting this season by the Sooners' Buddy Hield. Virginia (No. 1 in the Midwest) had no explosions in its final 10 regular-season games. I next inquired into what other skills and styles of play might contribute to a team's explosiveness (or lack thereof). The first things that occurred to me were that an explosive team was likely to play at a fast tempo (i.e., shooting early in the shot clock, generating many possessions per game) and be good at shooting the three. Results only partially supported these hypotheses (see the grey columns in the chart above). Note, however, that whereas explosiveness was only measured in teams' final 10 regular-season games (because combing through play-by-play sheets is time-consuming), all the other statistics are based on teams' full seasons. Michigan State, with seven explosive bursts, is first in the nation in two categories: three-point shooting percentage and defensive rebounds per game. Limiting opponents to one shot and making shots yourself should contribute to explosiveness. However, the Spartans are quite low in turnovers forced per game, which presumably works against MSU being able to score quickly. Oklahoma, which shoots well, cleans the defensive glass, and plays relatively fast, remains an enigma. Keep an eye out for whether the eight teams seeded No. 1 or 2 make it to the Final Four. Either the explosiveness statistic will go out with a bang or be a dud. Last Friday, ESPN.com ran a piece documenting the best 100-game stretches in U.S. college sports and major pro leagues such as the NBA, NFL, NHL, and MLB. At the time the article appeared, the University of Connecticut (UConn) women's basketball program had won 99 of its last 100 games (now 101 of its last 102). The legendary UCLA men's basketball program under coach John Wooden also had recorded a 99-1 stretch, from 1971-74. 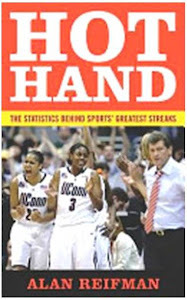 The UConn women under coach Geno Auriemma have been dominant since winning the first of their 10 NCAA national times (and compiling the first of their five undefeated seasons) in 1995. I, therefore, wanted to look at the Huskies' long-term success beyond their past 100 games. I decided to examine UConn's last 400 games, representing roughly the past decade of play. The Huskies' past 400 games span from the opening game of the 2005-06 season all the way to last night, when UConn routed Central Florida, 106-51. In these games, the Huskies are 377-23 (.942).